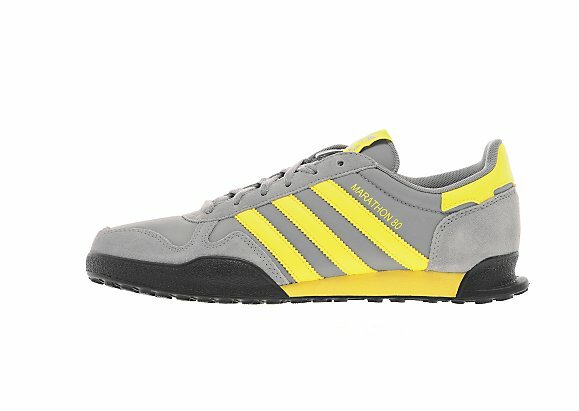 Adidas Marathon; A pair of trainers that have truly divided the casual community for decades. Many a Dassler-consumer baulked at the chunky, aggressive, mesh beasts when they first arrived on the scene 30+ years ago and have carried this view throughout the piece. Others were immediately smitten with the Teutonic-looking tech-spec on show and have remained keen admirers ever since. 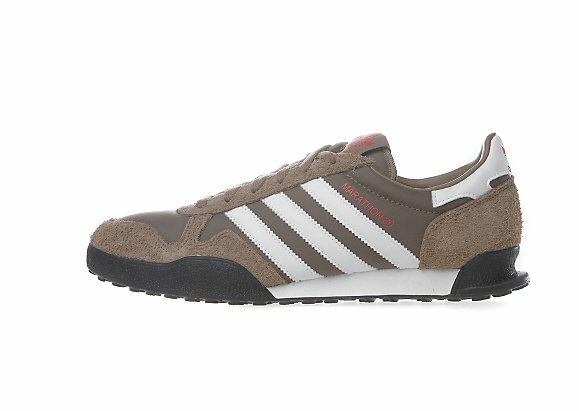 For a casual generation raised on low-profile, thin-soled Adidas silhouettes the Marathon (and its ilk…the LA, Kegler, etc…) came crashing-in like a Tiger tank in full combat camouflage and blowing a whistle. My first pair were the classic royal-blue with yellow stripes. They were early-nineties re-issues with a white mid-sole rather than yellow and they were a thing of beauty (I saw a lad at Villa away in 95 with a pair on with the colour-way reversed, teamed with a yellow Henri Lloyd Mac who remains one of the best dressed lads I’ve seen at the match). Their original purpose is, well I’m not really sure. They don’t appear to have much use for sport. They’re no use as running trainers with all that excess weight in the sole so despite the name you certainly wouldn’t run a Marathon in them. Their probable athletic role is as some sort of trail-walking shoe but I think they’re really just designed for walking on concrete and looking fly. Recent years releases have seen the Marathon stay at the forefront of restraint in Adidas’s reissuing strategy with bold colour-ways added to classic design keeping the Marathon a strong and consistent contender in the Originals range. The sole is obviously the key component of the Marathon. 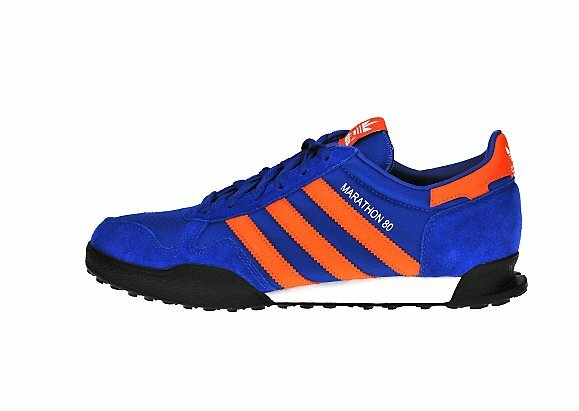 In the right colours/shades they’re a very (very) good-looking shoe and a suede and mesh upper is always a classic combination but it’s the sole that is the distinction of the Marathon, being constructed of loads of tiny Adidas trefoil logo’s. Crucially the trefoils creep out beyond the shape of the shoe creating the spiked impression around the sole. It’s what makes them Marathons. Not all Marathon fans have been fans of this innovation in sole though. I know a lad (from Burnley) who has had 3 pairs of Marathon over the years and has taken a Stanley knife to each pair in turn and trimmed the sole. Fallen rubber teardrops of tiny half-trefoils were left in his wake as he customised/butchered the shoes, leaving (still) a nice shoe but robbing the Marathon of its unique construction, individuality and well, it’s soul (As I said though…he’s from Burnley). There’s a patch of concrete on Tibb St in Manchester that is forever Marathon after I pressed the sole of mine into the drying concrete in 1996. A bottle of water soon washed the sole clean but the collection of tiny trefoils remains imprinted on Manchester’s streets forever more (until they re-concrete it anyway). Adidas have reissued the Marathon in a number of colour-ways over the years, some more fanciful than others but the originals involving shades of blue, yellow or orange keep returning and finding favour with new generations of Adi-addicts and seem set to carry on for a while yet. This entry was tagged adidas, Casual, Manchester, marathon. Bookmark the permalink.